An array of native wild flowers enjoy the generous precipitation and hot, humid summers of Tennessee. Wetland plants grow in the lowlands and swamps of the western part of the state, while woodland plants fill the eastern forests and mountains. These Tennessee wild flowers are adapted to the conditions and climate of their native environment and can make low-maintenance additions to the home garden. New England aster, or Symphyotrichum novae-angliae, reaches up to 6 feet tall. The thick, branching stems hold dense, hairy leaves that grow to 5 inches long. From summer until the first frost, 2-inch wide flowers of lavender, blue or white with yellow centers attract bees and butterflies. New England aster grows wild in moist, open woods and meadows and prefers acidic soil and full sun or partial shade. If planted in a dry area, provide supplemental water every 2 to 3 weeks. 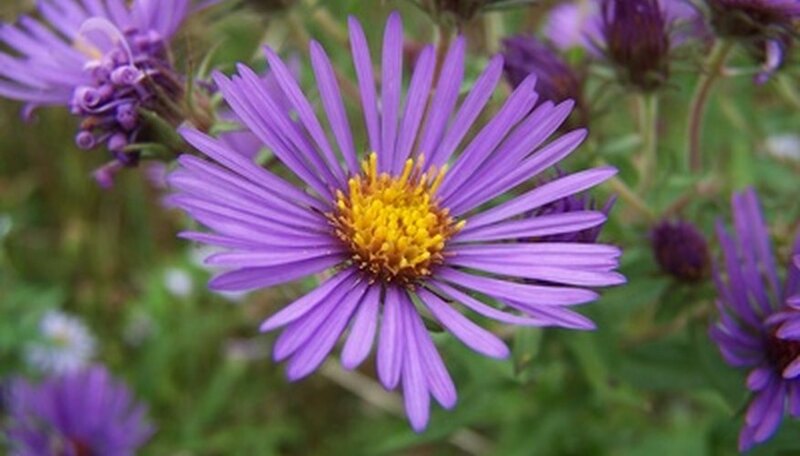 Divide this aster every 1 to 2 years in late fall or early spring to encourage vigorous growth. The perennial cardinal flower, also known as Lobelia cardinalis, can reach heights of 6 feet. Spikes of tubular red flowers, 8 inches tall, bloom from spring through early fall and attract hummingbirds. Lance-shaped, dark green leaves with jagged edges line the lower portion of the erect, singular stem. Native to stream banks, swamps and prairies, cardinal flower grows best in nutrient-rich soil and sun or shade. It requires consistently wet or moist soil and thrives in wetland gardens or wet areas of the yard where other plants may not grow. Cardinal flower is poisonous and should never be consumed. Firewheel, or Gaillardia pulchella, features heavily branched, hairy stems that grow to 2 feet tall and spread 1 foot wide. The soft, hairy leaves grow at the base of the stem and showy, daisy-like flower heads appear at the top of the stem during spring and summer. The red, 1- to 2-inch wide flower heads have yellow tips and a circle of brownish red disk flowers in the center. Firewheel grows wild in open areas such as prairies, plains and valleys and enjoys dry, well-drained soil and full sun or partial shade. Planting in nutrient-rich soil or applying fertilizer to these annuals can cause droopy growth and reduced flowering. Deadhead the blooms after flowering and provide a small amount of supplemental water in the summer to encourage another round of flowers. The upright stalks of Small's penstemon, or Penstemon smallii, grow between 2 and 3 feet tall and bear dark green, shiny leaves. In spring, clusters of 1-inch long, tubular, lavender flowers with white throats bloom atop the stems. Native to woodland edges and cliffs of the southern United States, Small's penstemon prefers acidic, well-drained soil and partial shade. This perennial will grow in moist or dry soil but does not tolerate excessively wet soil.